Sleep routines are for toddlers and teenagers, right? Surely as adults we are able to gauge how much rest our bodies require and when we should go to bed to ensure that we are fresh in the morning? Well, it turns out that sleep specialists actually advise individuals of all ages to follow a consistent sleep routine, and with very good reason. Here’s why. When your daily activities occur according to a regular schedule, your body is able to prepare for it because it anticipates certain events. I.e. if you get up at the same time every morning, you will naturally become more alert as your wake-up time draws near. If you eat breakfast at the same time every day, your digestive system will be activated in anticipation of nutrients so it's ready to process your meal effectively. If you wind down and start your bedtime routine at the same time every evening, you will naturally begin to feel sleepy when it gets to be that time. The process of aging is associated with a variety of physical and social changes that impact on the human body and psyche. When individuals reach the age of retirement, their social and family obligations can change to the point where they start to feel a little rudderless. At times like these, it's very important to stick to a regular daily routine that includes a set bedtime and time for waking. These parameters provide structure for the flow of the day and also ensure that older adults get sufficient sleep to maintain their immune systems etc. A regular waking time and sleeping time that suits your schedule. A regular meal schedule that has been tailored for optimal sleep (i.e no heavy meals or stimulants before bedtime). A cool, dark bedroom with a mattress and bedding that conforms to your personal comfort level. One or two calming rituals leading up to bedtime (e.g. reading, listening to quiet music, taking a bath, journaling, etc.). 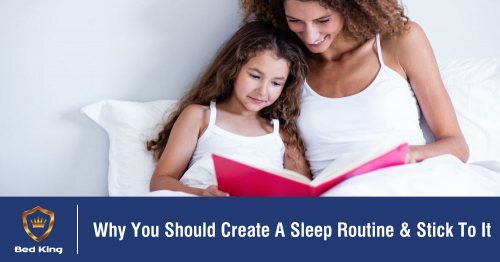 With all this in mind, it should be fairly simple to create a sleep routine that suits your lifestyle and you’ll be able to stick to in the long run. Keep an eye on the blog in coming weeks and months as we share more expert advice on subjects like these. In the meantime, we would like to invite you to take part in our #SleepRevolution. Sign up for the Bed King Sleep Challenge to stand a chance to WIN up to R20 000 in prizes. The competition is only valid until 16 February 2019, so this is the last week you can enter! Ts & Cs apply.